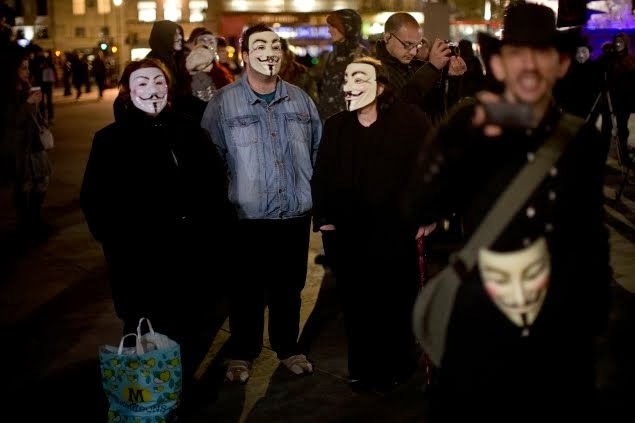 Five of one hundred masked and self-confessed hackers of government sites were arrested as the group held a rally and caused a one-hour traffic jam near the House of Representatives in Quezon City on Tuesday. "We are everyone and anyone. We will not go away and we will continue with our activities. We are here today to press for a new system of government," said the leader of a group called Anonymous Philippines, whose members, dressed in black, protested against the alleged misuse of development funds assigned to lawmakers. The protesters wore Guy Fawkes masks used by members of the internationally known hactivist group called Anonymous. The five who were arrested claimed they were members of Anonymous Philippines. They were questioned at the Quezon City Police District-Station, but were subsequently released, police said. Earlier, in reaction to the hacking of the websites of the Office of the Ombudsman and 37 other government sites, Communications Secretary Herminio Coloma said, "There are existing laws covering that and proper action will be taken [against them]." But he also said, "There is sufficient democratic space for any individual or group. That's why there's no need to commit illegal acts like the one that they did." In reaction, Senate President Franklin Drilon said the senate is "willing to listen" to the protesters' complaints. Sen. Ralph Recto acknowledged the country's "democratic space" for the hactivists. The Ombudsman is looking into the ₱10 Billion ($231.3 Million US Dollar) plunder allegation against three opposition senators, and 34 other congressmen and other government officials for their involvement in the mis-use of their Priority Development Assistance Fund (PDAF) with the help of Janet Lim-Napoles, a private businesswoman. Meanwhile, Senator Jinggoy Estrada denied a "fake news" story about his alleged arrest for failed smuggling of money to the US. "That is absolutely not true. I've been seen by a number of Filipinos and they were happy to see me; they even took pictures of me. That story is incredible to say the least," said Estrada in a statement. Estrada said he would return to the Philippines after his short visit to the US which began over the weekend. In the US, his wife would undergo a medical checkup for a lump in her breast. What's News, a satirical news website, said that Estrada who came in from Hong Kong was accosted at the San Francisco International Airport because he had a big lump on his chest. His wife was allegedly not with him. The story quoted Estrada as saying that he has developed his chest muscles, when asked about his bulging chest. The satirical news added, "But it turns out, his wife was not with him on the trip, and it was the senator instead who had a lump on his breast." After his purported body inspection, the bogus story quoted San Francisco International Airport security head Trevor Philip Ogg as saying, "We counted millions worth of Pesos that we suspect belongs to the Filipinos." The pesos were allegedly hidden inside Estrada's "muscles and skin". The incredible story was circulated in Facebook and other social media network. Filipinos in the US called up their relatives in the Philippines at five in the morning when the story started to spread online. Estrada, two other opposition senators, several congressmen, and former appointed officials are facing plunder charges before the Ombudsman in the Philippines. They were accused of approving the release of their Priority Development Assistance Fund (PDAF), with the help of a private operator, Janel Lim Napoles, to fake development projects and non-operating non-government organisations. The senators allegedly got back 50 per cent of the fund, Napoles, 40 per cent, and other government officials, 10 per cent. The court allowed Estrada to accompany his wife for a medical checkup in the US. Napoles is also set to appear before the Senate Blue Ribbon Committee. She has been detained in police headquarters in southern Luzon for a different crime she has allegedly committed: illegal detention of a relative who became one of 10 whistle blowers on the alleged scam.